Holly Whitford takes a breather during Collingwood's draw with Geelong at the Holden Centre. Photo: Shane Barrie. 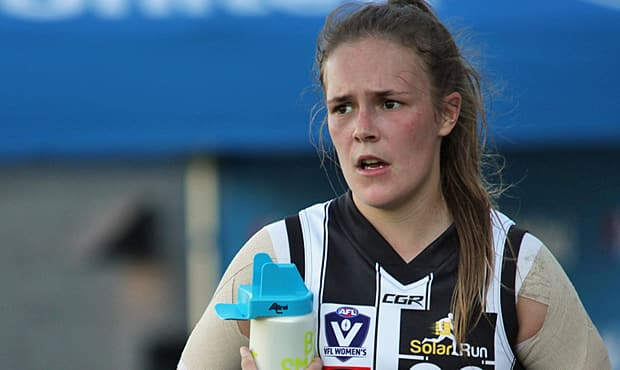 Collingwood left the Holden Centre with the unfamiliar sensation that follows a draw, following its 27-27 tie with Geelong in the second round of the VFL Women’s season on Sunday afternoon. Both teams produced a great contest from the opening bounce, and were unable to be separated by the close. “It’s an empty feeling,” said a reflective VFLW coach Penny Cula-Reid after the match. From early on, both teams struggled with their goal kicking and fans were left waiting until the second quarter for Geelong’s Hannah Burchell to put the first on the scoreboard. The Magpies had their opportunities throughout the match, but Cula-Reid said the team’s defensive pressure was their key tool in delivering a competitive performance. Click here to view Collingwood’s 2018 VFLW fixture. Another of the Magpies’ key performers was Mua Laloifi, who stood tall in defence, performing some wonderful deflections and blocks, provided a huge contribution to the contest. “Mua is a girl who has never played footy before and who has the confidence to come off her player and impact on the contest”, Cula-Reid told Collingwood Media. Erica Fowler contests a boundary throw in. Photo: Shane Barrie. A relative newcomer to football, Laoifi acknowledges she is still getting to know the game, but knows what the team will need to focus on in the upcoming weeks. “It’s a different game for me at the moment,” she said. The outstanding teamwork of Jessica Edwards alongside Sarah Dargan saw them sneak the ball out of the pack and onto Lambert, whose goal put the in the lead by a point late in the third quarter. But Danielle Orr had the quick reply for Geelong, kicking a major in the final minutes of the third to see the visitors to a five-point lead at three quarter time. The final quarter saw Alicia Habib kick another for the Cats, but the Magpies refused to give in, with Paige Nash and Eliza Hynes kicking two late goals to lock the scores at 27-apiece. Laoifi is looking forward to next week’s match against Richmond at the Holden Centre next Sunday and says the team has areas of improvement. “It nice to have an early start,” Cula-Reid said of next week’s 11am bounce against the Tigers.